The fourth REVIVE Round table focused on improving post-collision outcomes in Belgium, France, Italy, the Netherlands, Portugal and Spain. 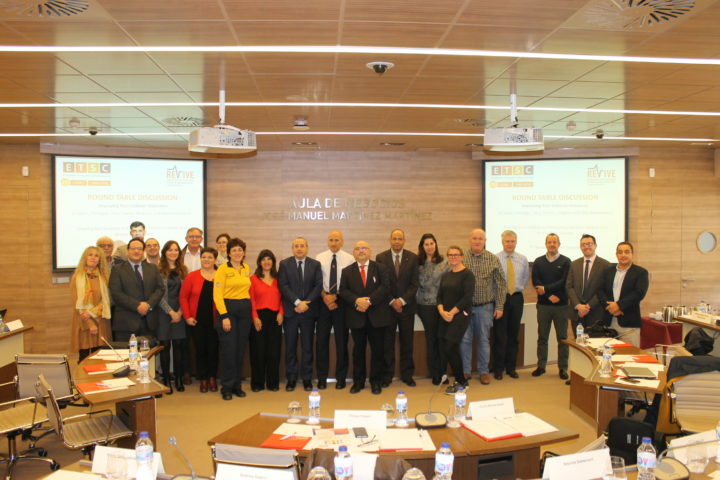 In the framework of the REVIVE Project, experts in Emergency Medical Services (EMS), Rescue/Fire Service (RFS) and road safety from Belgium, France, Italy, the Netherlands, Portugal and Spain met in Madrid on 7 November 2018. They discussed the way forward for improving post-collision response and emergency care across the EU. The meeting gathered representatives from health agencies, rescue services as well as researchers and other actors active in post-collision care and emergency response. The event was co-organised with Fundación MAPFRE and the European Federation of Road Traffic Victims (FEVR). The event started with a welcome from Carlos Novillo, from the Security and Emergencies Agency of Madrid. He highlighted the fact that there were 37,000 road crashes each year in the Madrid region. This is therefore an issue that is high on the agenda of the local emergency services. This was followed by a keynote speech from Luis Rincón Plaza, the Chief Officer Fire Extinguisher from the Rescue and Prevention Technical Unit of the Community of Madrid. In a brief presentation, he outlined the work and operations of the emergency services in the Madrid area, including the use of the 112 emergency number. Then, Laurence Atchison presented ETSC and its activities, as well as the REVIVE project. The first debate session focused on the ways in which emergency services access road traffic collisions and the issues that often arise – such as blocked roads and the use of lights and sirens. Laurence Atchison presented ETSC’s latest case study on the use of emergency corridors. This was followed by a discussion on how they operate in different European countries. Andrea Guerci, from the Automobile Club of Italy presented the Italian example and Maria Isabel Casado from the Directorate General of Civil Protection and Emergencies gave an overview of the local SAMUR-PC system. The second debate focused on the structure of the emergency medical services in each of the countries in question. Dr. Charles Mercier-Guyon, explained the SAMU system in the Haute Savoie department of France. Rui Campos from the Portuguese National Institute of Medical Emergencies then presented the approach to major traffic collisions in Portugal and the various emergency vehicle types available. Dr. Maria Giuseppina Lecce from the Italian Ministry of Health explained the structures in place across Italy and finally Kate Borkent explained the operations of the Amsterdam Ambulance Service. The final session of the day was a discussion of extrication issues and tertiary safety at the collision site. Kurt Vollmacher from the International Association of Fire and Rescue Services (CTIF) presented their recent work on the creation of rescue sheets and systems used to identify the structure and design of vehicles. Lt Col Philippe Chappet from France then presented the experience of the French fire and rescue services, noting in particular the importance of their safety on site. The session was concluded by Yolanda Domènech from Spain and the European Federation of Road Traffic Victims, who highlighted the experiences of the victims of traffic collisions, both at the scene and afterwards, as well as the ramifications for the wider community of friends and family. Each debate was followed by a Q&A session and a comparison of the structure of the EMS and RFS systems and work patterns between the representatives of invited countries. The event ended with closing comments from Jeannot Mersch of the European Federation of Road Traffic Victims and Jesús Monclús from Fundación MAPFRE.